How to get and use each item in Pokémon Go. This Pokemon Go Consumables guide offers a description of each consumable item in Pokémon Go. We will explain the best ways to use each item, as well as how to obtain special items like Master Balls and Super Potions. There are various different consumable items in Pokémon Go that can help improve your hunt for precious Pokémon. 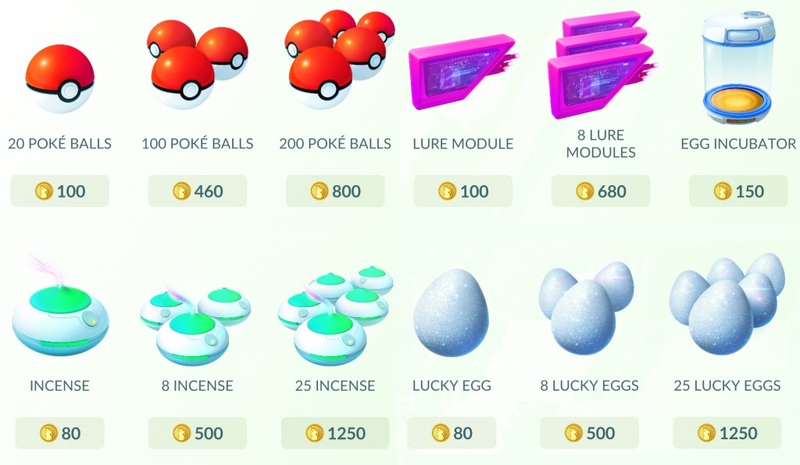 Most items can be exchanged with the in-game currency Pokécoins. Pokécoins can be purchased with real money, or earned by defending a gym for your team. If you run low on items and want to purchase them directly, head over to our guide on how to earn Pokécoins in Pokémon Go. Keep in mind that you don’t have to open up your wallet to replenish your inventory. All of the consumable items in the game can be collected from PokéStops or earned as level up rewards. Be sure to hit up each PokéStop you come across to stock up on free Poké Balls, Potions, and other valuable items. Poké Balls are the most important item in Pokémon Go, as they are essential for capturing anything in the wild. Checking in at PokéStops will almost always give you free Poké Balls, so be sure to swipe every PokéStop you can to ensure you never run out. You can also use PokéCoins to purchase more balls in the shop, where they come in various quantities. As you level up, you’ll acquire upgraded Poké Balls as well. There are two other types of enhanced Poké Balls: Great Balls and Ultra Balls. These are given to you at Levels 12 and 20. Each will increase the odds of capturing rare or difficult Pokémon in the wild. These enhanced Poké Balls are harder to come by, so use them only when needed. To make the most of Great and Ultra Balls, toss a Razz Berry at the wild Pokémon before using these enhanced balls to maximize their effectiveness. Potions are used to heal Pokémon after engaging in a gym battle. Standard Potions are unlocked at Level 5, which is also when gym battles become available. Spritz some Potion on an injured Pokémon to restore a portion of its HP. Like Poké Balls, there are three enhanced Potion types as well: Super, Hyper, and Master Potions. They are obtained at Levels 10, 15, and 25, respectively. Each version restores a higher portion of HP based on the potion type. The Max Potion is the most effective, as it completely restores a Pokémon’s full HP bar. Revives are used to revive a fainted Pokémon during a gym battle after their HP has reached zero. Revives are unlocked at Level 5, and an enhanced version unlocks at Level 30. The regular Revive restores about half of the downed Pokémon’s health, while the Max Revive brings the Pokémon back to full health. Pokémon Eggs can be hatched to acquire new Pokémon without having to capture them. Pokémon Eggs must be placed in an Egg Incubator and must travel a certain distance in order to hatch. The further you need to travel to hatch an egg, the rarer the Pokémon will be inside. For details on how to hatch eggs, head over to our Pokémon Go Egg Hatching Guide. As the name implies, Egg Incubators are used to incubate Pokémon Eggs and allow them to hatch. After acquiring a Pokémon Egg, select Start Incubation to place it into an Incubator. You have an infinite use Egg Incubator from the start, but all other incubators are limited to three uses. More incubators can be purchased from the Shop if you want to incubate multiple eggs at once. Remember, most consumable items can be obtained at PokéStops for free. Check in at PokéStops regularly to replenish your inventory stock, or level up to earn more items. Not to be confused with Pokémon Eggs, Lucky Eggs will double the amount of experience points (XP) the player earns for completing tasks that reward XP. Lucky Eggs last for 30 minutes, and should be used just before doing tasks that reward additional XP. If you plan to hatch, catch, or evolve multiple items at once, use a Lucky Egg beforehand to maximize your XP gains. Lure Modules and Incense are used to attract more wild Pokémon to a location. Lure Modules can only be used at a PokéStop to attract more Pokémon to the stop. Likewise, Incense is used on yourself to attract Pokémon toward your trainer. While other players can benefit from a single Lure at a PokéStop, only you can benefit from using Incense. If you plan to stay mobile while hunting for Pokémon, use Incense. Otherwise, plop down near your favorite PokéStop and drop a Lure Module for others to enjoy. Both items last for 30 minutes when used. As you level up, you’ll unlock three different types of berries that’ll help you catch and evolve Pokémon. At level 8 you’ll gain access to Razz Berries, which reduce the chance of a wild Pokémon escaping. At level 14 you’ll unlock Nanab Berries, which will make the wild Pokémon less likely to move or use attacks that deflect your Poké Balls. At level 18 you’ll receive the last of the berries - the Pinap Berry. Using a Pinap Berry will double the number of Candies you receive when capturing a Pokémon, taking regular catches from 3 to 6 candies, and stage 2 Pokémon from 10 to 20! Your Bag contains all of the items in your inventory, and initially holds up to 350 items. Once you go over the item limit, you won't be able to obtain more items from PokéStops or from leveling up. If you want more space, you can purchase storage space upgrades that will increase the size of your bag by 50, up to a max of 1000. Bag space can be managed by simply using up or discarding unwanted items. It’s good to know there are options for us PokéHoarders. Tagged with Android Devices,	AR,	Guides,	ios,	Larry Ahern,	mobile,	Niantic,	Pokemon,	The Pokemon Company.